List building Facebook ads are great . . . for list building. But what are you doing in order to bring in revenue from those brand new subscribers? Someone tries to get me on their list with an “easy” lead magnet (like a swipe file, checklist, PDF – something I can consume very easily) and then get me into a sales funnel by inviting me to a webinar AFTER I’ve become a new subscriber. 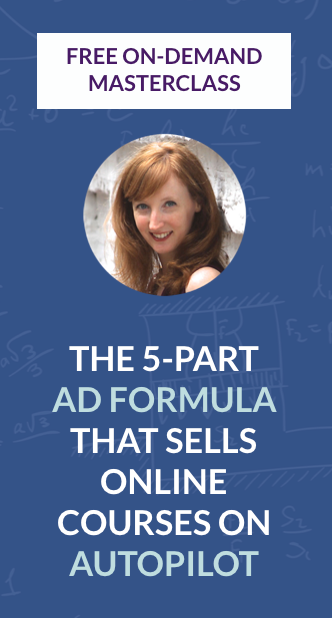 In theory, I love this plan – it takes care of the “webinar ads are expensive AF” problem that lots of people (myself included) have faced. Except . . . it doesn’t actually fix that problem when you look closely at the numbers. Let’s say you get people to sign up for your easy lead magnet for $1.50 each, and then 1 out of every 3 new subscribers opts in for your webinar once you email them about it. That means you actually paid $1.50 x 3 to get that one subscriber to sign up for your webinar. OK, that’s $4.50/webinar sign up. Not terrible. And then if half of those sign-ups actually show up? That means $9/webinar attendee. See how expensive this webinar funnel can get? And it’s not just webinars that get expensive. Even if all you do is give away dead-useful blog posts or videos to your subscribers week in and week out, there will always be people who never even open your emails and eventually unsubscribe. It’s just how email marketing work. And if this realization that you’re going to pay a LOT for an engaged subscriber via Facebook ads is super depressing, you are not alone. 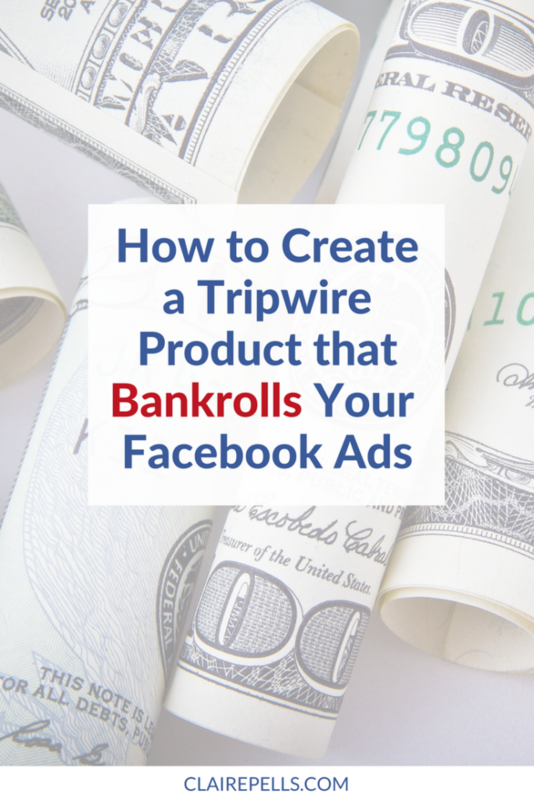 The tripwire product that brings in enough revenue to pay for your ad spend. You sign up, and on the next page (which I call the “thank you page”) you see an offer for a big discount off of Bullseye, one of my products. As you can see, there’s a timer at the bottom which tells you how much time you have left to get this special discount. I only give people until the end of the day, but some people will make it a 72-hour offer. In the email that delivers the swipe file, I also reference the special offer and link to a slightly different thank you page that has the same deadline on it. This ensures I don’t mess with my Facebook ad tracking when people visit the thank you page multiple times. If you bookmark any of the pages that show this offer, and try to come back tomorrow, the special offer pages will redirect to another page that doesn’t have the offer. I use Deadline Funnel for those timers and redirection, which create true urgency and make the offers automatically expire. People can still get that product after the deadline is up, but it’ll cost them a lot more. There are lots of different opinions on what your tripwire offer should actually be, and I don’t pretend to be an expert on it. But I can give you the details of how I created mine, specifically the entire process I went through from landing on the idea to getting it in place in my Facebook ads funnel. I knew that I couldn’t just create a lower priced product that taught the A-Zs of Facebook ads. If I did, no one would ever buy my signature course, Absolute FB Ads, which goes from the basics all the way to advanced strategies. Figuring out who to target was hard AF. 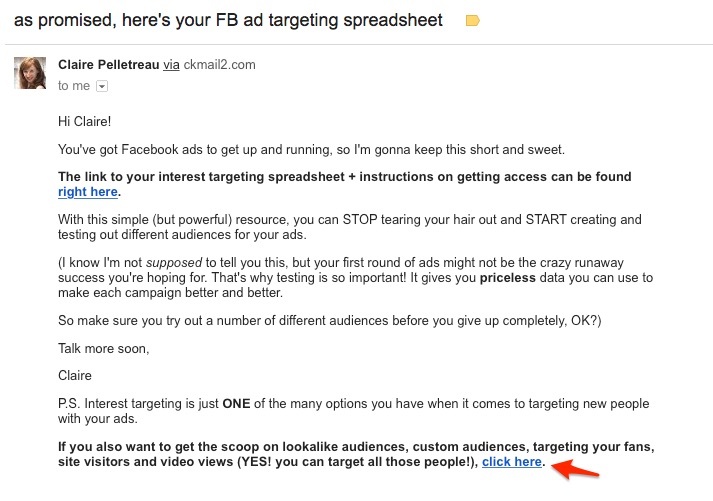 And as Facebook’s ad platform got more sophisticated, you had more and more options for choosing your target audience. It just made sense to put an explanation of ALL those different options into one place. 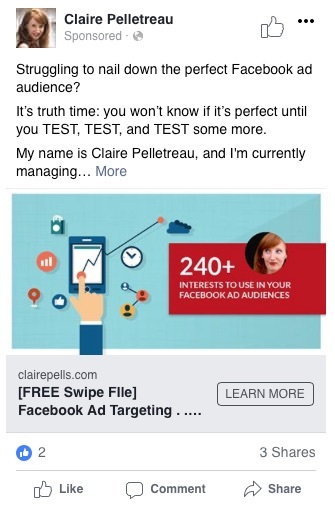 So the idea for an ebook on Facebook ad targeting was born, and I went about writing what eventually would become Bullseye. Bullseye took me way too long to make, which is true of most things in my business. Even though I knew it was supposed to be a lower priced option, I couldn’t be short-n-sweet about any of the explanations. I even included all the tutorials on how to actually create the audiences I walk people through. So because of how long it took me to create this product, I decided I needed to be compensated for the time and effort. That’s when I came up with the Pay-What-You-Want launch idea. I had been off on maternity leave for most of 2016, and even though I had come back in the fall, I hadn’t blogged regularly or been a consistent face in the world of Facebook ads for a while. A Pay-What-You-Want promo was the perfect way to really come back with a splash. So I created a longform sales page and set up Gumroad’s Pay-What-You-Want option on the order form, designating $5 as the minimum payment. Then I emailed my list about it a bunch of times over a 10-day time period. I ended up selling 756 copies of Bullseye for a total of $8,625 in revenue. The average amount people paid was $10, but the majority of people paid $5. It was a number of $20, $25 and even a few $50 sales that brought up that average. So I made over $8K in profit to create this tripwire product. I’m so glad I ended up doing the Pay-What-You-Want offer, even if I kind of stumbled upon the idea after spending too many hours on the content of the ebook and tutorial vault. Now that the Pay-What-You-Want promo was over, I had to put this product in place when people signed up for my list. And as always, I struggled with the same thing: how much should I charge for this thing? I had never seen a tripwire product go for more than $20, but the $7 price tag I saw on a lot of people’s special offer pages felt WAY too low for the value that people would get from Bullseye. So I settled on $18 as the discount price, and $36 for the retail price of Bullseye found on my site. But I quickly found that I had seriously underpriced it, and the price fluctuated a lot in the coming months. Whenever I talk about this part, people always ask exactly how I landed on the current price and positioning. I’ll tell you how: by paying attention to weekly cohorts. How many people landed on the special offer page (because they signed up for one of the lead magnets I had connected this offer to)? How many people bought Bullseye at the special price. We tracked this for almost 15 weeks, and made changes to the price point and discount depending on the data. When I saw it converting really well at $18, I doubled everything. The full price became $72 and the discounted price became $36. The conversion rate stayed steady at those prices. The next thing I tried was raising the full price to $97 and the discount to $48. The conversion rate dipped down, so I left the full price at $97 and lowered the discounted price to $36. I adjusted the language on the offer page to talk about a 63% discount instead of 50%. The conversion rate came back up and has stayed there, so I haven’t messed with the price since the middle of 2017. Want a Google doc to help you track your own conversion rates across weekly cohorts? Make a copy of mine here. As I mentioned above, I use Deadline Funnel to power the timer and the expiring pages. Deadline Funnel comes in so handy month in and month out that it’s one of the tools I’m happiest to pay for. The sign-up page for the targeting swipe file. If you check it out, you’ll see that I have a mini-survey on it where I ask people why they want to learn about Facebook ads. This helps me auto-segment my list between entrepreneurs who are researching Facebook ads to use in their own businesses, and ad consultants (or potential ad consultants) who may be a great fit for the Ad Consultant Incubator. The thank you page with the special offer on it. Swipe file delivery email. Anyone who signs up, regardless of which option they choose in the on-page mini-survey, receive the swipe file via email. This email also includes a mention of the limited-time discount on Bullseye. Nurture sequence for non-ad consultants. People who say they’re interested in learning about Facebook ads for their own businesses receive one set of emails that tells them more about me and teaches them more about ads. Nurture sequence for ad consultants. 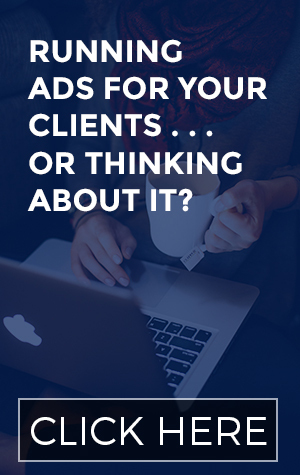 People who say they’re running ads for clients or thinking about it go into a difference sequence where I talk more about the highs and lows of running an ad consulting business. 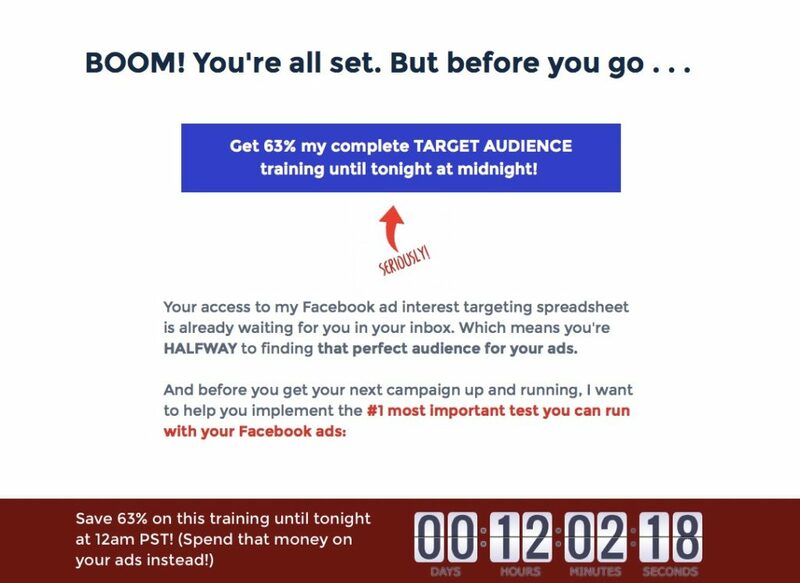 The one thing I may eventually add to this funnel is some kind of pitch for my signature Facebook ads course, Absolute FB Ads. But to be honest, I’m really into the relationship building that happens on my webinars, so I save my pitches for those moments. This may mean I’m missing out on sales, but I’ve seen the impact making a connection with people live has had on my business, so I’m sticking with this plan for a while. Truth time: this took me a while to put into place. A LONG while. But I’m so glad I did, because now my tripwire pays for most if not all of my Facebook ads, even to cold audiences. 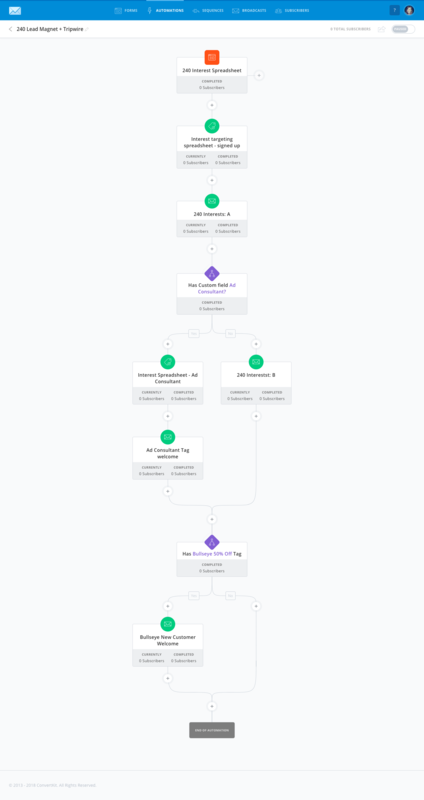 After analyzing my own results for this Facebook retargeting ads post, I realized how foolish it was that I wasn’t running the same ads to cold traffic. So the ads are back up and generating sales as well! And now it’s your turn. First things first: get a basic retargeting campaign up and running so you can see whether it’s cheaper for you to run ads to cold or warm audiences. And then take some time to brainstorm your tripwire product. Before you create it, think about surveying your audience to find out what micro-challenge you can help them solve with a lower priced product! Heads up: some of the links in this post are affiliate links, which mean I may earn a commission if you choose to sign up for one of the tools I talk about.